In this article, we bring you the top 10 best LED TVs under 25000 available in India as of March 2019. We have covered best LED TVs from various top brands like LG, Samsung, VU, Micromax, Kodak etc. You will see that we have covered various sizes of LED TVs. You will see options in 32 inch, 40 inch, 43 inch and 49 inch. It is crazy that these days you can get a 43 and 49 inch LED TV for under Rs. 25000. The trend you will see here is that LED TVs from big brands like LG, Samsung are expensive and you can get only 32 inch LG or Samsung LED under 25k. But, when we see new or small brands like VU, Kodak, Micromax, we have plenty of large LEDs with 39 to 43-inch display sizes in this price range. While most of the LED TVs on this list are non-smart, you will find a couple of Smart TVs as well. The difference between smart and non-smart TV is that you can connect your Smart TV to your WIFI at home and office and play videos, movies directly from the Internet. Resolution of most LED TVs is Full HD 1080p and some of them have Ultra HD 4K resolution which provides excellent clarity. Now let's take a look at best led tvs under 25000 in India 2019. We have listed a brief review, specs, and pros cons of every television to help you find the best one. This is a great value for money 43 inch 4K LED TV from Kodak. The TV comes from Kodak's latest 2019 series of LED Televisions. The display panel of this tv is 43 inches large and has a resolution of Ultra HD 4K. 4K resolution means great clarity and you will be able to see even the tiniest detail of every frame. Its High Dynamic Range is powered by HDR 10 which means you get lifelike natural colors and great viewing experience. The audio output of the TV is 20W and is delivered by the dual speakers. The speakers perform well and do not distort much even at high volumes. The bass is satisfactory. You can always plug in external speakers if you need a better sound experience. It is a smart tv and you get all smart functionality like social media apps like Facebook, video streaming apps Netflix, YouTube and pre-installed games as well. Just connect the TV to your WIFI and you are ready to go. The user interface of the TV looks good and is easy to navigate. This is a fully loaded LED TV from Kodak and is one of the best 43 inch 4K LED TV under 25000 in India as of 2019. This is a 40 inch Smart LED TV from Thomson and it comes with a Full HD Panel. The display panel is gorgeous with high contrast, good brightness, and great viewing angles. If you play high definition content, the images look beautiful with natural looking colors. You can adjust the colors according to your preferences as well. The sound is delivered by 20W dual speakers which are loud but not the best in the segment. If you don't prefer very loud sound, you will like the audio output of this tv. There are plenty of HDMI and USB ports available to connect devices like gaming consoles, set-top box, pendrive, laptop etc. This one is a Smart TV and connect it to WIFI to watch videos and shows on Youtube, Netflix etc. Some games are also preloaded. You can install more apps and games via the app store on this tv. Overall, this tv provides a good watching experience. Thomson has very attractively priced this TV at under 20000. So, go for it if you need a nice 40 inch Smart TV under 20000. This is a 40 inch Smart LED TV from iFFALCON and comes with Full HD resolution which makes the display bright with proper clarity. This TV from iFFALCON is the most economical Full HD Smart LED TV and is exclusively available via Flipkart. The television comes with an A+ grade panel and a micro dimming feature where your TV automatically adjusts the brightness depending on the type of content you are watching, like sports, the different type of movie etc and is a good feature for a smart tv under 20000. As in all smart televisions, this also has inbuilt WiFi and comes with iFFALCON app store to install various gaming, social media, entertainment applications. The remote has a dedicated button for the Netflix to quickly launch it in a second without browsing or searching through the menu. This TV is smart in terms of sound as well and it again automatically detects the type of programme you are watching and enhances the audio experience. In addition, the inbuilt stereo box speaker and Dolby audio provide a powerful sound output and a good experience overall. We believe, that it is a great TV for the pricing of 15k to 20k with good response from users but if you are a brand savvy and are looking for LG or Samsung, then you will have to spend around 25k-30k. This is a very affordable Smart LED TV from Mi with a nice display size of 43 inches. The display is beautiful with rich colors, good contrast, and brightness levels. The viewing angles are good as well. The resolution of the display is Full HD and the pictures are very detailed. The LED TV features 20 W powerful stereo speakers to enhance your listening experience. The sound output is good and you won't feel the need of adding external speakers. The TV is powered by a 64-bit quad-core processor and has 1GB of RAM and 8GB of storage. Switching between apps is smooth and you won't face any lag. The OS is Patchwall which is well optimized and has plenty of preinstalled apps. There is no Google play store though which is disappointing. You can stream content via WIFI and you can also use the USB and HDMI ports to connect external devices. Screen mirroring option is also there. Go for it if you are looking for a large 43 inch Smart LED TV under 20000 to 25000 Rs. Cloudwalker is a decent brand in the LED TV segment. Their LED TVs have decent quality and priced low compared to other big brands like LG, Samsung, and Panasonic. This LED TV from Cloudwalker comes with a large 43-inch display panel of 4K Ultra HD resolution and Smart TV functionality. The display is sharp and the 4K resolution makes each scene look real and bright with vivid colors. This television has 2 speakers and the audio output is good but not too loud. Apps like Netflix, Youtube are already installed so you can begin watching your favorite tv shows and movies directly via internet. This 43-inch tv uses a Screen-Shift Technology which allows you to watch content from multiple sources like DTH/Cable, external devices or TV on the same screen without changing the source of the display every time. The pricing of this LED TV is excellent. Go for it if you need a 4K Smart TV under Rs. 30000. It is rated 4 stars out of 5 by more than 2000 users on Flipkart. VU is one of the favorite brands for users who look for good configuration television in low budget. This 49 inch LED TV from VU offers a great viewing experience because of the high contrast and good viewing angles this television offers. The resolution of the display is Full HD and uses A+ grade panel that enhances the clarity. The sound output of this 49 inch full HD tv is also decent and uses AmpliFi Sound to amplify and produces loud sound. It is decent enough that you will not require any external speakers and can hear it in the whole room. There are 2 HDMI and 2 USB ports to play external media and connect external devices like a gaming console, set-top box etc. Overall, a great value for money LED TV from VU under 25000 Rs. Samsung products cost more compared to smaller brands like VU, Kodak etc. Same is the case with this LED TV from Samsung. But in that extra pricing, you get better quality, brand trust, and best after-sales service. If you have a good budget, then you should not hesitate to buy LG or Samsung. This is a 32 inch Smart LED TV from Samsung with HD resolution. The colors are vivid, bright and natural and offer a decent viewing experience. It runs on Smart Convergence technology that allows you to share your smartphone content on the TV wirelessly. The speaker output is 40W via the 4 speakers on this TV. The audio experience is one of the best you will find in this range. The display comes with HDR technology because of which you can watch content with stunning clarity and detailed color expression. All kinds of bright and dark scenes look accurate because of this technology. Another nice feature is Micro Dimming Pro which divides the screen into zones and analyzes each one for deeper blacks and purer whites. This helps to provide more depth to images. This TV has 2 HDMI and 1 USB port, out of which 1 HDMI will remain connected to your set-top box. Others can be used to connect a pen drive, laptop or gaming console. At a price of under 25000, it is a decent smart television from Samsung. Panasonic used to be one of the best brands in India but they have lost track in the last few years. Still, Panasonic products have good quality and their service network is also good. 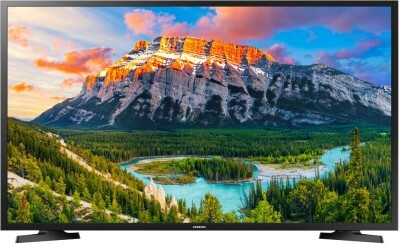 The 32 inch LED from Panasonic is one of the best value for money Smart TV under 25000 range. The display size is 32 inches and offers a resolution of 1366 x 768 pixels. You’ll be able to enjoy HD Ready videos and movies in all their glory. The resolution is suitable for large screen TVs such as this one. The display panel is bright and sharp and viewing angles are good as well. As it is a Smart TV, you can connect it to your home or Office WiFi and stream content directly from the internet. You can also mirror your smartphone display to the TV if you want to share what you are watching on your phone. The overall performance of the LED is good and you won't be disappointed. Go for it if you are looking for a 32 inch Smart TV under 20000 or so. LG is a big brand in India and offers great quality in its products. This is a 32-inch smart led tv from LG with some amazing features. It has an IPS Panel with HD ready resolution and produces images that look real when looked in original from eyes. It has perfect colour reproduction and best clarity. It is a smart tv from LG and has many useful features inbuilt. This LED runs of webOS which is easy to use. It has a preinstalled Tellybean application that allows you to enjoy free video calling on your TV to talk to your friends and family. Also, this operating system allows you to create shortcuts of the frequently used applications and programs so that you can access them quickly. This smart LED TV also allows you to play any audio or video content from your smartphone using WiFi. The webOs also gives you notification of the incoming or missed calls, social media messages, email etc on the television screen itself. There is one more interesting feature in this LG 32 inch smart LED TV, which allows you to record on-air TV shows and watch them later, or to watch them again. It has 2 HDMI and 1 USB port to connect to the external display or setup box, the pen drive can also be used to expand internal storage and can be used for recording tv shows. The feature list does not end here, this LG LED uses Intel WiDi (Wireless Display) that allows you to connect your TV and Computer monitor wirelessly. With these great features, this smart tv also has perfect sound quality with its 20 W speaker output and gives great effect to the sound when watching an action movie or the one that has sound effects. This LG LED TV is simply one of the best smart LED TV under 25000 in India. VU is selling LED TVs online only and that's why they have been able to keep the prices lower than Samsung and LG while maintaining quality. VU Iconium 43 inch Smart LED TV offers the best value for money. The metal frame design makes it look stunning. The 43-inch display has an Ultra HD (4K) resolution which is the best display available in under 30000 pricing. The display is of A+ grade panel and has the best colour saturation and the content looks all beautiful in this 4K resolution television. The display is bright and sharp with good viewing angles. This Smart TV runs on Android 7.0 operating system which easy to understand and navigate for people of all age group. The remote of this Android TV has a dedicated button for YouTube, Hotstar so that you can start using these apps instantly. In this smart tv, you can connect the TV via WiFi or the ethernet. With the Ultra HD resolution of this Android Smart TV, the videos look real as seen by the eyes. The HDR technology on this TV also enhances the clarity and crispness in the content you see. You can also stream video from your mobile phone using the WiFi. Various apps like Netflix, Eros, skype, facebook and other social media and entertainment apps are supported on this television. It has 2 speakers with a total output of 20 W. The sound output is loud and clear and you would enjoy each moment of playing games or watching content on this VU Android smart TV. If you have a lower budget but are looking for a quality smart TV you can choose this one as it is our top pick for best led under 30000 and also the best 4k led tv below 30000 in India. So this was our list of best led tv under 25000 in India 2019. We hope it was helpful and you were able to find a suitable LED TV for your home or office. You can a bigger display size if you spend more, take a look at our list of best led tv under 30k to see more. There were 10 options on this list so if you are still confused and wondering which one you should buy then go with our favorite below.